E-health does not only imply technological progress but also a new framework for improving citizens’ health. E-health has many strong points, which include clinical applications, and training devices. Health websites have a tremendous impact, as they increase accessibility to health information. Therefore, they encourage patients in becoming a prudent actor who decides where to go and what to do. However, many patients are not familiar with the precise meaning of e-health, which varies with the context in which the term is used. Moreover, they are not familiar with terms associated with e-health. Nevertheless, the Internet might contribute towards patient-centeredness, as patients might get their first opinion from the Internet. However, websites should meet reliability and comprehensiveness requirements. Patient-centeredness argues that healthcare professionals have to be responsive to patient preferences and needs. On the other hand, patients should be a prudent actor who decides where to go and what to do in a sensible manner (Kaisser, 2000; Rong-Huang, 2003). As a result, patients need e-health technologies, which improve accessibility of information. 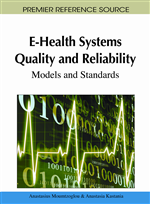 First cited by Mitchell in 1999, according to Jadad in 2005, e-health implies clinical appliances, professional training devices, accessibility of information (including hospital outcome information), and education (Eysenbach, 2001; Richardson, 2003; Carrasco, 2002; Suarez et al., 2005; SEIS, 2008). However, patients are not familiar with terms associated with e-health (e-mail, e-commerce), and as with most neologisms, the precise meaning of e-health varies with the context in which the term is used. Nevertheless, the internet might contribute towards patient-centeredness (Pallares, 2000) as patients might get their first opinion from the Internet, and then go to visit their doctor. In a study conducted among arthritis patients (Hay, 2008), 87.5% of them looked for information before attending the consultation. Moreover, the use of e-mail by doctors and patients improves communication (Car & Sheikh, 2004). Therefore, it is likely that its use by doctors and patients will gradually increase, given the fact that its adoption rates are low (Lorenzo & Mira, 2004). For example, Leong et al. (2005) found that the number of messages is lower than the number of emails. On the other hand, doctors can respond to the more ‘Internet informed’ patient in three ways. In the first scenario, the relationship between the health professional and the patient becomes health professional-centered. In this scenario, health professionals may think that their medical authority is threatened by the information the patient brings. Therefore, they might respond defensively, asserting their ‘expert opinion’. They will also use a brief consultation to quickly and authoritatively steer the patient towards their choice of action. The second scenario involves the collaboration between the health professional and patient. After all, many patients not only have the time, but also the incentive to search for information about their health problems. As they are usually only interested in one condition, their search is mostly focused (McMullan, 2006). In this scenario, health professionals (not only doctors, but also nurses, psychologists, therapists, etc.) argue that they do not have the time to search for every clinical condition. However, they do have the expertise to analyze the information and assess the relevance to the patient (Lorenzo, 2008). In the third scenario, the health professional recommends websites and guides patients to reliable and accurate information. However, it then becomes crucial for the health professional not only to understand the information, but also where to get it on the Internet. As it is difficult to keep track of all the information that is on the Internet, health professionals should know about reliable repositories of health information and medical links. Jadad (2005) suggested that e-patients and doctors share websites and medical office equipment is organized so both can look up the Internet during the consultation. As a result, we have an intruder in the consultation room or the clinic. Study findings point out that (1) patients have no problem with the use of a computer in the consultation room; and (2) doctors are willing to use a system that they feel it derives benefits for patient care (Aydin et al., 2004).